The Maglula M-16 / AR-15 StripLULA wins as the enthusiast's quick-load and convenient solution to in-the-moment reload needs. 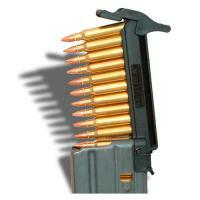 The M-16 / AR-15 StripLULA is designed for use with all M-16 / AR-15 5.56mm metallic and polymer magazines. Gone are the days of achy fingers and wounds of self infliction with this bad boy. StripLULA is a third of the size of all other loaders that are available on the market, so carriage is non-obtrusive and lightweight. Loads all 10, 20, 30, 40 and 100 round 5.56 / .223 magazines such as those for the Beretta AR 70-90, H&K metal 416 / SA80 and M16 / AR15 / M4 USGI (NATO STANAG 4179). Maglula maintains south-paw friendly loads, and the strength of polymer holds up in extreme climate conditions up and down the mercury. The M-16 / AR-15 StripLULA keeps your load capability fluid and free.